The area of Bloomsbury represented in this plan has been part of the metropolitan estate of the Russell family, the Earls and Dukes of Bedford since the 17th century. Many of the names of the streets and squares reflect this connection. 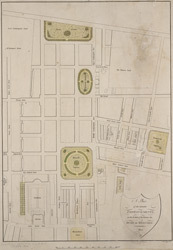 The plan shows the old British Museum simply marked ''museum'', Russell Square, Brunswick Square, Tavistock Square, Nursery Ground are all indicated as green spaces. Bloomsbury Square is marked by a pecked line and coloured green. Bedford House has become Bedford Place, constructed in 1801-5 by James Burton. Under the 6th Duke of Bedford the area was developed north and east, principally by James Burton and Thomas Cubitt. The resulting squares became a favourite area for writers and painters.